Does a person know which overarching personal and/or professional goals are worthwhile and meaningful for him/her? Is the person able to habitually maintain a balance between his/her different personality parts and facets? Or does he/she frequently experience episodes of inner conflict? Does the person have the “inner permission” to the reach his/her goals? Does he/she have the feeling of deserving to really get what is aimed for? Does the person dispose of the prerequisite self-management abilities? E.g., is he/she willing to invest sufficient resources (e.g. working hours) in the realization of his/her goals? Is the person willing to take the proverbial extra mile in order to reach his/her goals? Can he/she mobilize the necessary energy reserves when the going gets tough along the way? A questionnaire for the measurement of these personality aspects was developed. The participants´ results subsequently were correlated with their satisfaction with life as measured by the instrument of Ed Diener. Additionally, demographic variables such as age, gender, education, occupational group etc. were taken into account. The element “General Consensus” (a person´s “inner permission” for success/satisfaction), seems to stand out of the VIGOR ensemble: it displays the most robust statistical connection with life satisfaction and, besides, it may function as a kind of catalyst for the development of the remaining VIGOR elements. Apparently, there are people who – for different reasons – feel they are not allowed to be successful and satisfied; they lack a “license for satisfaction” – which, in the end, became the book´s title. Here, a potent self-fulfilling prophecy seems to be at work. Some people do not reach their overarching goals (which leads to more life satisfaction) because they feel they do not deserve to. This strongly contradicts conventional self-help wisdom which regularly states: You can do anything if you only want to!. The truth may be closer to something like this: You can do (almost) anything if you feel you´re allowed to want to! The book is written in popular science style: It blends a reader-friendly writing style and personal narratives with scientific facts and figures. There is one chapter for every VIGOR element: first, the relevant scientific background on the respective element is explained. Subsequently, three self-coaching exercises are presented which may help the reader to further develop the respective VIGOR element. These exercises are accompanied by illustrative case studies from the coaching practice. Every chapter closes with a brief summary and suggestions for further reading. In the appendix, a detailed report on the VIGOR study can be found. Besides, it contains the same questionnaire which was used for assessing the participants´ VIGOR and satisfaction with life scores. That way, each reader can determine his/her own scores. This, in turn, can be utilized for monitoring one´s progress when working with the self-coaching exercises. 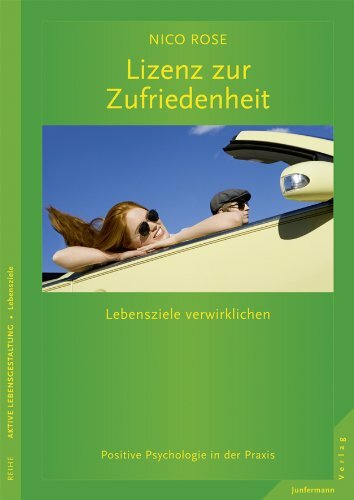 * If you are a publisher or agent who might be interested in publishing an English translation of “Lizenz zur Zufriedenheit” (License for Satisfaction), please do not hesitate to contact me via e-mail.